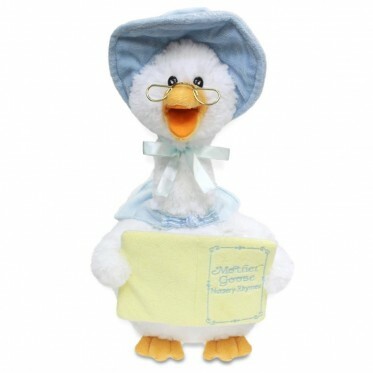 This animated singing Mother Goose plush toy will read stories to your child! This cute white plush goose is styled with reading glasses, bonnet, a shawl and a book of nursery rhymes. The Mother Goose will read 7 different nursery rhymes: Jack and Jill, Hickory Dickory Dock, Little Bo Peep, Humpty Dumpty, Twinkle Twinkle Little Star, Little Miss Muffet and This Little Piggy! When you squeeze Mother Goose's wing, she recites the different nursery rhymes in a calming voice. Her head and beak moves through the duration of the stories.